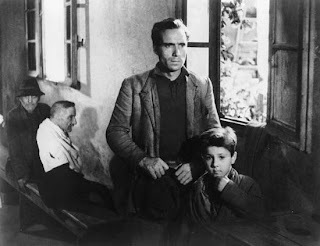 "Bicycle Thieves" (sometimes singularized as 'Thief' which I prefer') is routinely cited as one of the greatest films ever made, and justly so. It truly is a timeless classic, as powerful today as it was back in its day. “Bicycle Thieves” is one of the quintessential films of the post-war 'Italian Neorealism' era, a period of raw, minimalist social-conscious films made on location and with largely non-professional actors. Lamberto Maggiorani's performance as Antonio is so marvelous it's difficult to believe prior to filming he was just a regular factory worker plucked out of obscurity by De Sica. His soulful eyes express instant compassion before he ever has to say a single word. It’s a remarkably simple concept – it's postwar Rome and jobs are scarce, especially for a humble Italian working class man like Antonio Ricci (Lamberto Maggiorani). He’s offered a job postering billboards, which he can only take if he’s got a bicycle. Though he's doesn't have enough money for one he takes the job anyway. His kind and resourceful wife (Lianella Carell) sells her bedsheets from her dowry so Antonio can complete the purchase. Working life bliss until the bike is stolen right under his nose. Antonio and his young and impossibly cute little boy Bruno (Enzo Staiola) go out on an arduous adventure scouring the city in search of the bike. With the help of his friends, they search the markets, the soccer stadium and all other high traffic areas to no avail. Along the way we watch as the loyal Bruno follows with absolute worship Antonio’s every move. Their bond as father and son grows culminating in the ultimate test of Antonio’s personal ethics and his ability to set an example of moral strength. De Sica make Antonio’s predicament as frustrating as possible. He and his wife have sacrificed a symbol of their marriage for the bicycle, something which he needs to provide for his child. There is nothing in Antonio’s character that should cause this unfortunately accident, except as a test of his moral fortitude. As Antonio's obsession increases he gradually loses sight of his own personal ethics. Though Bruno remains intensely loyal Antonio increasing treats him like a tool or instrument of his search, often whistling at him like a dog. The finale brings Antonio over the edge of righteousness completing a role reversal from victim to thief. He, himself, steals a bike, as an act of desperation, one which he knows is wrong and thus hides from Bruno. And the biggest indignation for Antonio, and us, the audience, is the disappointment in Bruno’s face when he sees his father's shameful act. It’s a simple but profound lesson to cherish. We don’t know what happens after Antonio reconciles with his son, but we assume he will get his bicycle back somehow – life has a way of evening things out, but not before Antonio's learned a little more about the priorities in his life. Nice encapsulation of one of the most revered movies ever made. Bicycle Thief was one of my first forays into world cinema. Interestingly, this was also the movie that compelled Satyajit Ray the cinephile to become Satyajit Ray the auteur. The rest, as they say, is history. every time i'm in the subway in NYC and see the guys who put up the new posters/ads i think how shocking it is there hasn't been a hip-hop high school remake of this starring Nick Cannon. Alan, wondering why you prefer Thief (knowing that Thieves is the technically correct way it was titled)? The first time I saw the film it was from a VHS box titled 'Bicycle Thief'. But I do think it's a stronger sounding title, putting the focus of the picture solely on Antonio. A BLUE FONT EDDIE MURPHY POSTER!